Kicking off the festival on Friday 9 June, TMAG will host a live broadcast of ABC Radio National’s Books and Arts Daily program from the Central Gallery. Hosted by Michael Cathcart, the broadcast will delve into the Dark Mofo program, featuring a panel of invited guests as well as a live musical performance from legendary Australian musician Paul Kelly. Also at the museum’s city site in Dunn Place, TMAG will present Extinction from Thursday 8 until Wednesday 21 June. This will see the iconic silent footage of one of the last known Tasmanian tigers projected upon TMAG’s historic Watergate wall as an after-image of existence. While the last known thylacine (Thylacinus cynocephalus) died in the Beaumaris Zoo in Hobart on 7 September 1936, this film portrays the zoo’s second-last animal. The iconic footage, which also features in TMAG’s Thylacine Gallery, was filmed in 1933 by David Fleay, a well-known zoologist. 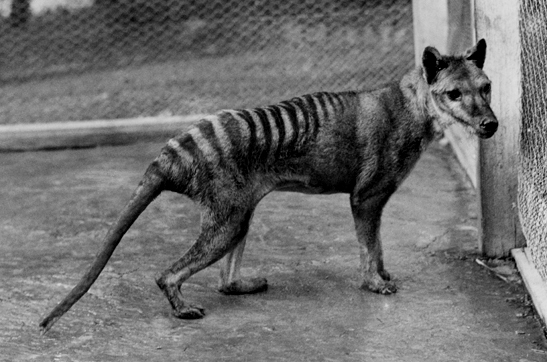 Working under a black cloth to film the thylacine, Fleay did not see it moving behind him and was bitten on his buttocks – he carried the scar for the rest of his life. In Battery Point, Narryna will present Brigita Ozolins’ Death Mask from Friday 9 until Wednesday 21 June. Visitors will be able to confront Tasmania’s convict history through death masks of executed criminals created according to the nineteenth century pseudoscience of phrenology, which sought to decipher an individual’s personality traits and criminal proclivities through the shape of their skull. Ozolins will stage a highly theatrical tableau within Narryna’s exhibition rooms. A central draped showcase containing a mysterious object will be surrounded by a series of light boxes containing images of phrenological masks of executed convicts from Tasmania, Norfolk Island and New South Wales. An adjacent room will contain actual death masks, medical models, phrenological instruction busts and instruction manuals. Narryna’s façade will be illuminated with a projection of the hexafoil, a pre-Christian symbol to ward off evil, there will be a festival bar in the forecourt and tours of the house will also be available. ABC Radio National’s Books and Arts Daily live broadcast is in TMAG’s Central Gallery on Friday 9 June from 10:00 am to 11:00 am. All are welcome, and the museum’s main entrance will open at 9:45 am to allow guests to take their seats prior to the broadcast. Extinction is on show outside TMAG’s main entrance, Dunn Place, from Thursday 8 until Wednesday 21 June between 5:00 pm and 10:00 pm. Death Mask is at Narryna, Hampden Rd, Battery Point, from Friday 9 until Wednesday 21 June. Narryna will be open from 10:00 am until 6:00 pm during this period, with extended openings until 10:00 pm on Fridays and Saturdays. Entry is via coin donation. To see the full Dark Mofo 2017 program, visit the festival website.